It's tough to stand out as the nerdiest person at the local D&D game, but this new accessory could easily help you win this position. When it comes to Dungeons & Dragons accessories, there are some great ones out there. There are things like groovy miniature figures, dice bags, and that Beholder catnip toy, but this new DIY project may very well take the title of "Most Epic Piece of Nerdery": A bracer that will roll virtual dice with a shake of your arm. 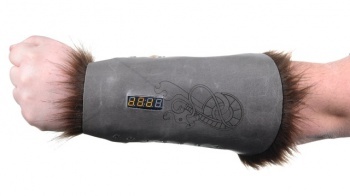 The bracer is designed to be made from leather, lined with fur, and it can roll eDice (I'm trademarking this term, I swear) of the 100, 20, 12, 10, 8, 6, and 4-sided varieties. All you have to do is flip an small switch to determine which type you want to roll and shake your arm. The result appears on the bracer's display. My crafting skills are limited to what I can assemble with duct tape, staples, and Krazy Glue. Thankfully, Sparkfun has even the most basic of crafter covered, thanks to its detailed instructions (with photos) that will walk you through every step you need to do follow in order to craft your own bracer and get +5 to your Nerd Appeal.